Fortune Cookies | Bernie Siegel M.D. What I found were “coincidences” which were connected so meaningfully that their “chance” concurrence would be incredible. The other night I needed a message to help me direct my life and picked out a fortune cookie for advice. Well, it was very helpful. It made me wonder who had sent the cookie at that moment for me to read. Is it all really chance, or is there an intelligence at work here? I reflected on such happenings and how they end up affecting our lives. Sometimes what seems like a small or even upsetting event can end up saving your life. I used to call these events “spiritual flat tires.” Even though they upset you when they happen, like the flat tire that makes you miss a plane that ends up crashing, they were ultimately there to help you. I always say there is a schedule to the universe that we all need to get on and be in harmony with. 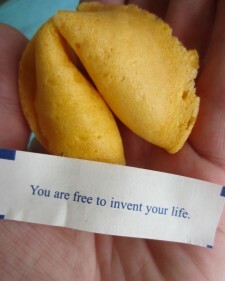 We should look for the fortune cookies and seeming detours that are sent to get you on track for your true destination. This entry was posted in Creativity, Spirituality and tagged Carl Jung, finding meaning, meaningful coincidences. Bookmark the permalink.